This post is all about my trout rig, which allows one to fish for rainbow trout with bait that floats up from the bottom of the lake. When my wife and I started using this rig, we went from getting skunked frequently to being part of the 10% of fisherman that catch 90% of the fish. Often, after someone fishes next to us and has no luck, they’ll come over, say that powerbait isn’t working for them, and ask “what bait are you using to catch so many fish?” If they aren’t too proud to give it a try, they’ll wander away and start catching fish. Even people that have decades of experience are sometimes really amazed by the difference it makes. I’ve tried to be as clear as possible in this post, but nothing can beat first-hand experience. Just about anyone that I actually know is welcome to come fishing with us and get a first-hand demonstration. Trout love cold water, so they will most often be near the bottom of the lake. Fishing from the top of the lake requires an entirely different rig, which might be better at night or when it is twilight. The twilight hours at dawn and dusk are when you will find trout at the surface, eating insects. A fishing pole strung with 6 or 8 pound test line. A slip float, ideally the exact type shown here. I believe mine is the Thill brand. A hex nut that is just a little bit larger than the shank of the slip float. A roll of plumber’s tape. 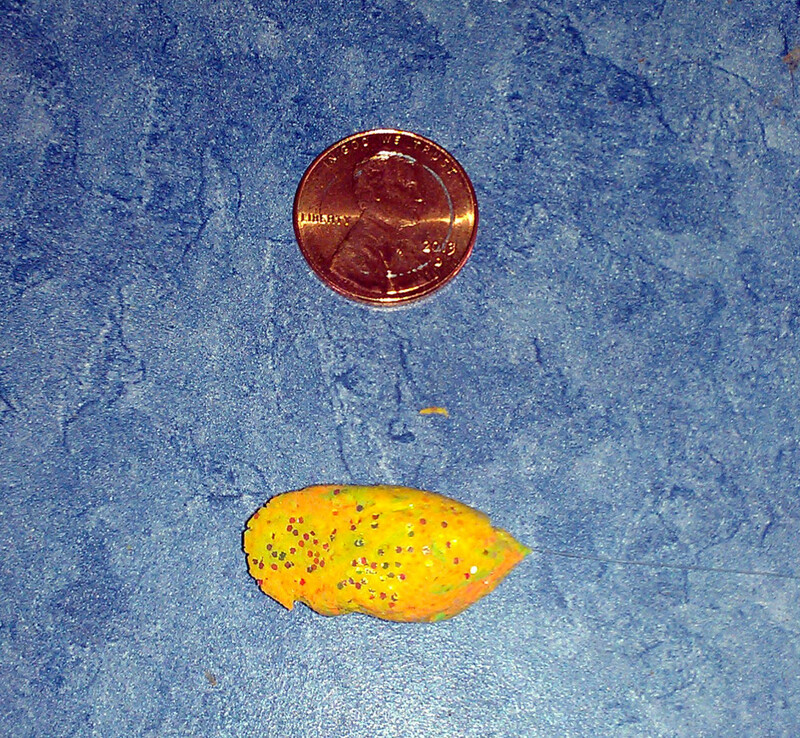 A barrel sinker, 1/4 to 1/2 ounce. The one in the picture is 1/2 oz, 3/8 is ideal. A spool of 4 pound test fluorocarbon fishing line. You can even use 2 pound test, which is VERY hard for the fish to see, but you’ll have to fight them longer and use a very low drag setting. A small snelled hook. Size 12 or 14 is ideal, but never go larger than about size 8. These are US sizes, no idea what other countries use. You can see the end of the fishing pole at the far right side of the picture. The pennies are there for scale purposes. Apologies to any readers who are not familiar with US currency. Wikipedia will tell you how big a penny is, which will hopefully also give you an idea of the hook size. To put this together, start with the slip float. Wrap plumber’s tape around the lower shank until you’ve got enough so that the hex nut threads will hold their position on the plumber’s tape. Cover enough of the shank so that you can move the hex nut up or down about a centimeter without losing grip on the threads, then pull the plumber’s tape tight. This hex nut does two things: 1) It keeps the float vertical in the water so you can see the color. 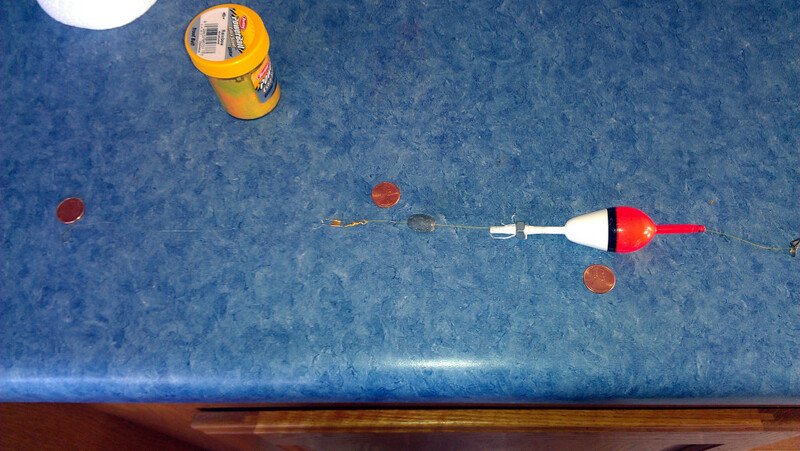 2) It adds some extra weight for long casts. When you put the slip float on your fishing line, thread the line through the colored end first, not the white end. After the slip float goes on, slide a barrel sinker onto the line. You can use a bullet sinker too. They don’t work quite as well, and you need to be sure that you put the pointy end on first. After the sinker, tie the line to the ring end of a snap swivel. You can use a standard swivel that has rings on both ends, but then you can’t swap out your leader easily. Use a swivel with a ring that’s large enough so it cannot go through the barrel sinker. For casting, I find that a sideways cast works a lot better than an overhand cast. The goal here is to have your tackle drop to the bottom of the lake, but have your slip float remain at the top of the water. After you cast, it is a good idea to put a small amount of tension on the advancing line right before the tackle hits the water, so that the line straightens out and the tackle doesn’t get tangled around the float. You should see additional line go out after the tackle hits the water, showing that it is sinking to the bottom. After the tackle hits the bottom, reel in a little bit to tighten up your line. The bait will float up from the bottom several feet (the length of your leader) where the fish can find it. If all goes well, you can leave your tackle out indefinitely. Unless you are dealing with unusual circumstances, it will stay put and there is no need to continually reel in and cast out. When a fish strikes, they will be able to easily pull the line through the sinker and the slip float, so they often get themselves hooked before they ever feel any real resistance. The float is not truly necessary, but it does a couple of things for you aside from adding weight for casting: You can see your position in the water easily, and when a fish strikes, you’ll very often see your float move across the water or dip below the water. I tend to watch my fishing line more than the float, though. If you find that you are getting a lot of tangles when casting that prevent your tackle from going to the bottom, you may need to adjust the vertical position of the nut by turning it a few times. This affects the overall balance of the tackle and can prevent problems. After a while, you will need to change out your rig because fishing line does eventually wear out. This rig requires a relatively low drag setting. You have at most a four pound pull limit because of the leader, but also remember that even the best fishing knot can only handle about 90 percent of the fishing line’s rating, so figure you only get about 3 pounds of pull before your line breaks and the fish gets away. You can catch very large trout on this rig, but they’ll be able to pull your line out easily, so you’ll have to fight them for a while. Wonderful! It really is an ingenious thing you two have done.